Fall is in the air and I get ready to celebrate the season with the Lil Divas I thought it was the perfect time to share a few of my favorite fall themed crafts and activities from the past. Ready for some fun fall crafts? Don't forget to check out my Fall Fun Pinterest Board for even more great ideas! 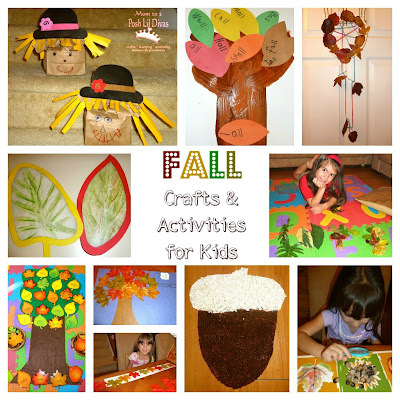 Do you have a favorite fall crafts or activity? Have fun and be sure to come back to see what we are up to this year! Those are some great crafts. I know my kids would love to do some of those. Stopping by from SITS. thank you for sharing this ideas. I'm constantly looking for ideas for lil man. Will have to recreate some of these. Thanks!!! Very cute! Visiting from SITS! Looks cute! I think you'll be interested in this thing as well.